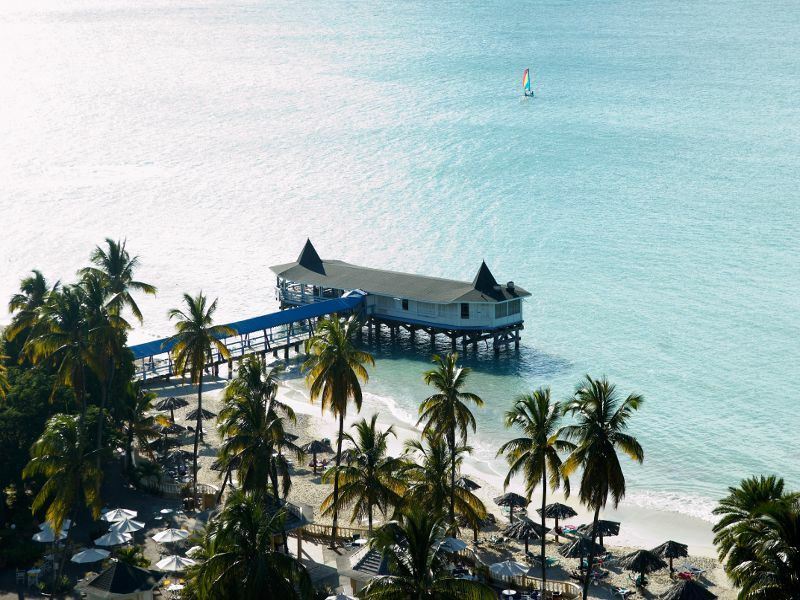 Antigua is said to have an incredible 365 beaches, this means you could visit a new beach every day of the year. Although if you are only on a short holiday you may not have that much time! So with that in mind if you visit only one beach while you are there then I would definitely pick Dickenson Bay. Soapy blue waters and perfect white sand all backed by a lush green hillside; this beach has it all. Simply relax and unwind or if you like to be active on your beach holiday then this bay can cater for all your needs. Sneaky Pete’s beach bar is a good place to set up your base camp for the day. With sun beds to hire and drinks and snacks on offer you can’t go wrong! This is also a great place for water sports. Jet skis, kayaks and hobie cats are all available to hire as well as banana boat rides. Wadadli Cats offer great catamaran boat cruises and pick up right from the shoreline at Dickenson Bay. I went on superb boat cruise with them to Bird Island. Here I explored, did plenty of sunbathing, snorkelled and had a barbeque on the beach. A fantastic day in paradise and one I would highly recommend. For a beach activity with a difference why not explore the glistening shores on horseback, go for a ride early in the morning to have the bay all to yourself! Dickenson Bay has two great restaurants at the south end of the beach. My favourite is Coconut Grove, with its romantic waterfront setting and delicious menu offering an array of seafood dishes, as well as a variety of dishes for non-fish lovers. It is in the perfect viewing spot for watching the sun go down. The Beach restaurant has a lively more informal atmosphere, and is just next door to Coconut Grove. It has a menu with a variety of dishes ranging from pizza, to burgers and seafood. They often have live music in the evenings too. If you just want to eat on your sun lounger then there are plenty of takeaway options and vendors offering snacks. There are also lots of stalls on the beach and friendly sellers to buy souvenirs from. Nothing beats reclining on a sun lounger here and soaking up the sun, while listening to the gentle lapping of the ocean and the faint beat of reggae tunes in the distance. My idea of beach paradise! Halcyon Cove by Rex Resorts is a great place to base yourself for the ultimate beach holiday; all the rooms are only a few steps from the beach. Choose from garden, poolside or beachfront rooms. With a variety of bars and restaurants ranging from casual to more formal, you can dine however the mood takes you. The Warri Pier restaurant is a private pier located right over the water, very romantic! After dinner relax in the bar or soak up some traditional Caribbean entertainment. Halcyon Cove has a variety of water sports including kayaks, diving, and sailing; meaning you can step right in to the heart of beach life. This is a family friendly resort with a kids club on offer meaning everyone gets some quality beach time! 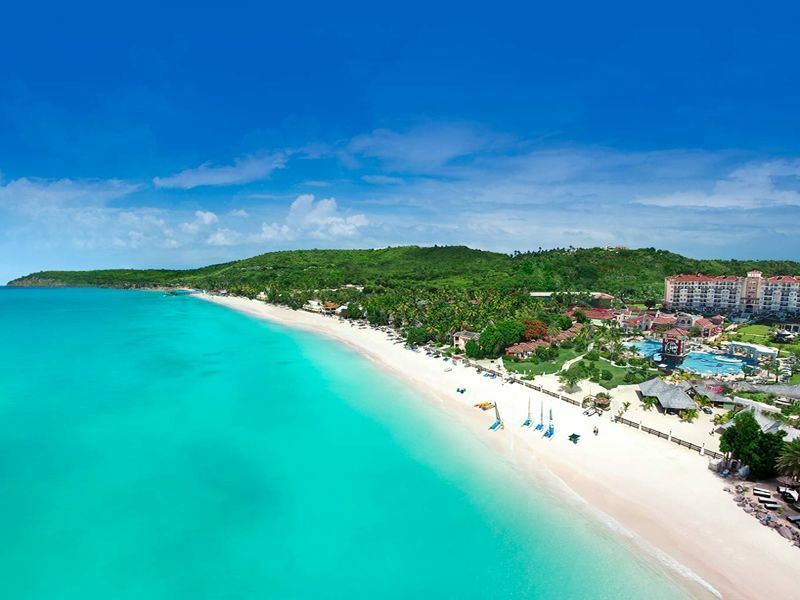 The Sandals Grande Antigua Resort & Spa, is a resort like no other! The Mediterranean village and Caribbean Grove combine a 2 in 1 resort experience. The Mediterranean village is full of European charm and sophistication. Here you will find a British pub, an Italian restaurant and a French patisserie. Ocean villa suites complete with private plunge pool, Jacuzzi and butler service are the ultimate private retreat for two. A range of penthouse suites with beautiful views and a pool overlooking the beach mean you can choose to relax on your balcony or by the pool and still see the sparkling ocean. The Caribbean Grove is set in lush tropical gardens. Take your pick from ‘walkout’ beachfront, garden or poolside rooms or a luxurious beachfront ‘Rondoval’. These circular shaped properties come with their on private plunge pool and butler service. With eleven restaurants ranging from Caribbean cuisine to Oriental and everything in between you can try something different every night! The whole resort offers a range of water sports and six swimming pools. Evening entertainment includes themed nights such as carnival and beach parties, so go ahead and immerse yourself in the local laid back culture. If you still need more relaxation and rejuvenation the Red Lane Spa will fulfil your every need, from a massage on the beach to a full body slat scrub or sugar glow. If you like adventure and want to spend some time away from the ocean then Antigua Rainforest Zip Line Tours could be just the thing for you. See Antigua in a whole new way as you travel at fast speeds across the zip lines high up in the canopy of the rainforest. An exhilarating experience you won’t forget! Another of my favourite activities to do in Antigua apart from spending time on the beach is a visit to Shirley Heights on a Sunday night. Watching the sunset over English Harbour from this lookout point is magnificent! With local bands and a barbeque you can dance the night away Caribbean style! This has to be the best view point in Antigua and is worth a visit at any time, even if you don’t make it up there on a Sunday.